I usually don’t do any kinds of custom templates since they’re very limiting on my creativity (“create something that everyone would like” aka standard plain version.) However, with the unlimited freedom given for Delicious Library 2 templates, I’m excited to do something that visually match the flashiness of DL2. 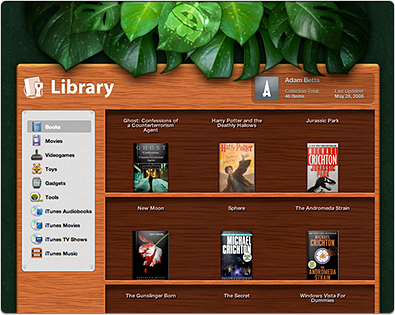 When browsing the library pages on iPhone, it will switch to lite version. There’s also a print template. You can modify existing templates to your liking. One more post coming soon. 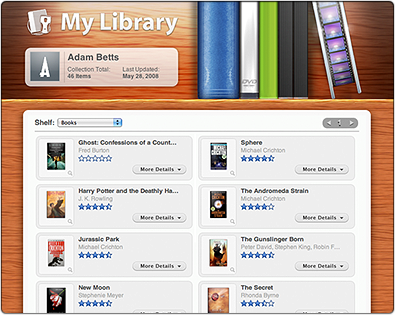 You can download a trial version of Delicious Library 2 from www.delicious-monster.com. Pingback from Greg Reinackerâ€™s Weblog - Musings on just about everything. Heh nah. It’s just a flattened black silhouette so mockup isn’t too weighty. These are some really cool posts, but I’d love to see some with your process creating the icon or the interface, with sketches and other mockups or something. But wheres the iPhone chrome!!! :P Looks great man, love the second design all leafy. Adam – I have been thinking these are amazing after playing around with DL2 for a bit; I’d like to customize my own web templates with DL2 to be basically white & simple, but have a cool pop-up effect of information when you mouse-over them – do you recommend a way of modifying a blank template? Mosscow, Wil Shipley is planning on adding support for easy web template customization but no eta on that yet. In a related news, next x.1 update to DL2 will include a new web template that is much more neutral. I can’t wait to see the new template… Are you designing that as well? Wow I have been designing for 3 years and I can’t do half the things you can! Pingback from iPhone template for Delicious Library 2 - Greg Reinacker’s Weblog - Musings on just about everything. Hmm. Why did you make it so the cover art is so small and so spaced out? Will DeliciousMonster ever give us the ability to customize the size of the cover art? 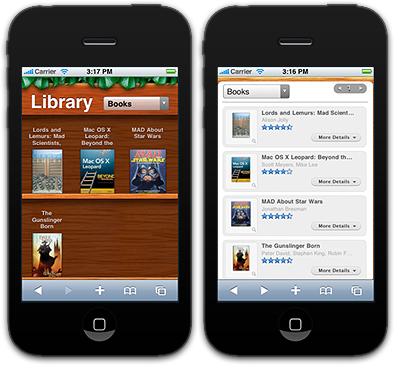 How can I rich the link on MobileMe what I have Published from my Deicious Library 2? Pingback from MacHeist » Forums » Share yor delicius library!